A few days ago I decided to get serious about the aphid infestation in my chiles. So far I had tried insecticidal soap with pyrethrins, and Neem. The insecticidal soap/pyrethrin spray that I used was a disaster. I was not aware that the insecticidal soap could be phytotoxic to chile plants. The chinense plants seem to be particularly susceptible. My poor plants dropped most of their leaves and blossoms. 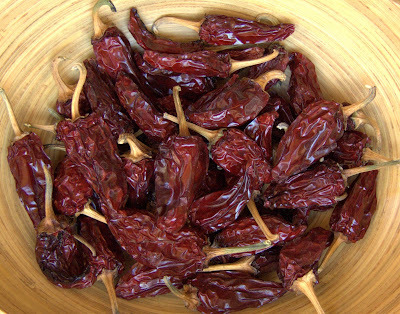 Fortunately, the chiles that had already formed were not affected. 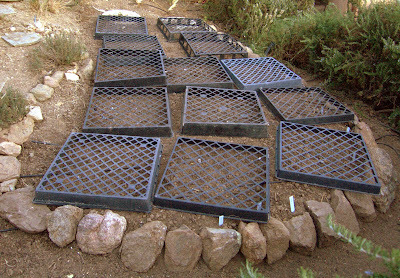 However, I didn't get around to caging most of the plants for seed saving purposes until after the "treatment". Not only do I not have much of a chile crop, but I don't have many seeds to save - none for a few varieties. On top of all that, once the plants started to recover the aphids came right back. Then, seemingly overnight, the caged plants were infested again. Only the caged plants. Okay, Neem again. But this time the aphids did not go away. And, for some reason, there were a bunch of male aphids flying around. It was getting really disgusting in there. Next treatment option: pyrethrin. Even though pyrethrin is an organically approved treatment I had hesitated to use it. First, it was part of the disastrous first treatment. Second, it is more toxic to benficials than Neem or insecticidal soap and I could see some parasitized aphids along with the tiny wasps that lay their eggs in the aphids. I hated to murder beneficial insects, but they were not keeping the infestation in check. I treated with pyrethrin anyway. Today I checked up on the chiles. Dead aphids everywhere. And live beneficial wasps! The unhatched wasps must not have been hurt by the spray. Plus, the plants look okay too, well, no worse than they looked before. Now I'm hoping that, with a little TLC, I can get the plants to survive through the winter. I've had pretty good luck with chiles in past years, but they've been healthier specimens. Spider Mom did it! She's got babies. It's amazing to me that she chose a spot that is the same color as her, her egg mass, and the babies. Hiding in plain sight. 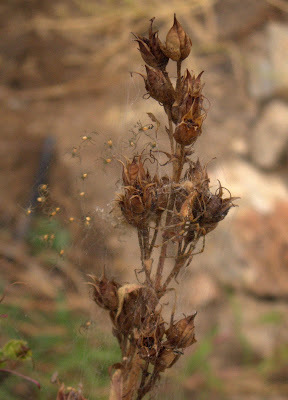 I tried to figure what kind of spider she is (they are), but there are so many thousands of spiders in the world..... I do know, however, that there are Black Widows and Tarantulas close by. Oh, and I did see a couple of scorpions. While I was checking up on Spider Mom, I noticed the honey bees going for the wild arugula blossoms. It's difficult to get a decent shot, especially with my camera (Santa, are you listening? ), so that's the best I could get. 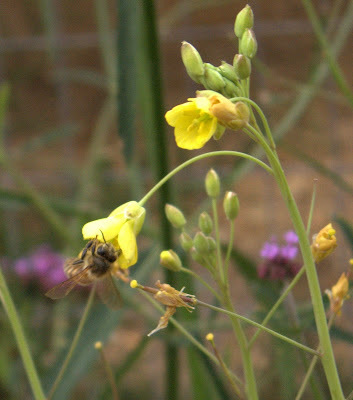 Did you know that arugula blossoms are delicious? The tomatoes are still ripening on the vine and I picked some beauties yesterday. Tonight, dinner is a platter of Hillbilly, Ananas Noir, and Large Pink Bulgarian tomatoes to be topped with buffalo mozzarella and fresh picked basil. A bowl of fried padron peppers and some crusty Della Fattoria bread will round it out. And then there's still some apple tart from a couple nights ago. I haven't been sure how to use the Czech Black chiles that I grew this year. They don't have much punch when used fresh. Their flesh seems to have no heat, just a touch in the seeds and ribs, and they don't really have a distinctive flavor. Rather than just give up on them I've been drying them. Just a form of procrastination I suppose, wait until later to toss them when I can't figure out a use for them. So, when I set about making a salad with the last of my Ojo de Cabra beans from Rancho Gordo I put a couple of whole dried Czech Blacks into the bean cooking pot. The pot liquor didn't pick up much chile flavor though. But, I still didn't give up on them. The pods had softened but not split or fallen apart so I removed the stems, cut the pods open, removed the seeds, and then scraped the softened flesh from the skins. Then I pureed the flesh with some sherry vinegar and a clove of garlic from the pot of beans and incorporated that into a dressing with olive oil, ground cumin, and dried oregano. The salad consisted of the beans, some cut-up leftover roast chicken, sliced celery, thin sliced red onion, and cherry tomato halves. Wow, it was really tasty! The chiles added a very pleasant, subtle warmth. Still didn't have a distinctive chile flavor, but the warmth was just sooo perfect. I might have to try soaking a few more chiles and making some chile paste to warm up some other dishes. But first I am going to try one more thing with the fresh pods - stuffing them, with something, I don't know what yet. Hmmm, I wonder how they would taste pickled? It looks like I'll get another harvest of the Andine Cornue paste tomatoes. I made one batch of tomato puree and one of tomato paste from these. These little chiles really pack a wallop! I dry them and use them whole in stir frys. Time to harvest another green salad. 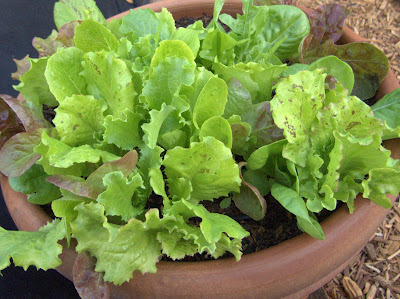 It's also time to replant the other pot of mixed lettuces, I noticed some bitterness in the last picking. I didn't get around to roasting the Piquillos and they started to shrivel. So instead of trying to roast them I decided to dry them and attempted my first ristra. 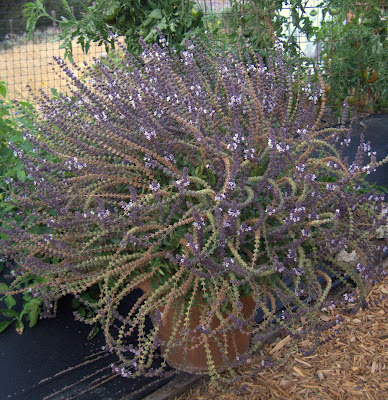 Otherwise known as African Blue Basil. 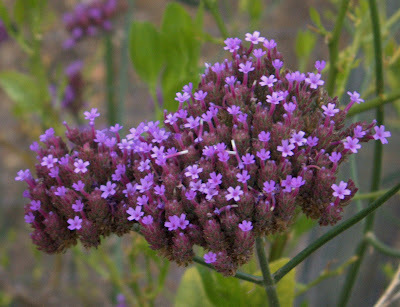 This plant is an absolute magnet for honey bees and other pollinators and beneficials. Another magnet for beneficials and pollinators. This one likes to volunteer around the garden. The sun is coming up over the ridge. 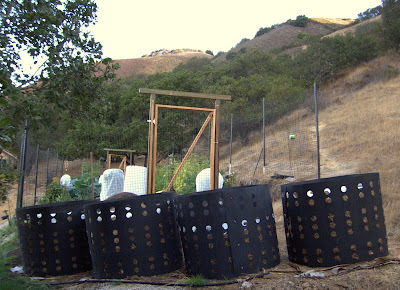 I've been using the compost from one of the bins, the rest are close to ready. I like to sift the compost and incorporate the fine stuff into the soil and use the chunky stuff as mulch. We do like pizza around here. Not your typical pepperoni, the works, overloaded types though. Yesterday I picked the first few leaves of Cavolo Nero and put it on pizza. Toss the sliced potatoes and minced garlic with enough olive oil to lightly coat all (about a tablespoon). Arrange the potato slices on a baking sheet and lightly sprinkle with salt. Roast in a very hot oven until softened but not brown. Set aside. (The peeled garlic cloves for the kale can be roasted with the potatoes). Steam the kale until tender (2 minutes in a pressure cooker). Let cool, then squeeze by handfuls to remove excess liquid. Coarsely chop and then toss with the sliced garlic and a little olive oil. Set aside. Roll or stretch the pizza dough into a 10-inch round. Drizzle the dough with a little olive oil and brush it evenly over the surface with your fingers. Sprinkle the grated Gruyere evenly over the dough. Arrange the potato slices evenly without overlapping over the surface of the pizza. Top with the chopped kale. Bake on a preheated pizza stone at the hottest temperature your oven can manage. Sprinkle with a dusting of parmigiano and drizzle with a bit of truffle oil before slicing. The light was lovely this morning so I took a number of photos. There's only one pod of the St. Lucia Yellow for seed saving. The insecticidal soap treatment for aphids really devestated this plant. This plant bounced back from the aphid treatment so there are a few more pods for saving and cooking. The first Rositas of the season! Los Algarrobos is really late also. You can see the ubiquitous aphids, which are probably potato aphids. The potato aphids seem to love all solanums, they're on all the eggplants, peppers, and some of the tomatoes. 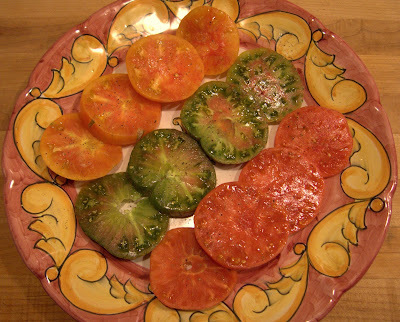 These tomatoes were supposed to be Aunt Ruby's German Green, but they lose all their green when they ripen. The header at the top of the blog is a photo of last years Aunt Ruby's. The mystery tomato is quite delicious. Hillbilly got off to a really slow start this year. I harvested only 2 tomatoes! Fortunately, the wonderful warm weather that we are enjoying this fall has prompted a nice flush of growth and fruit set. 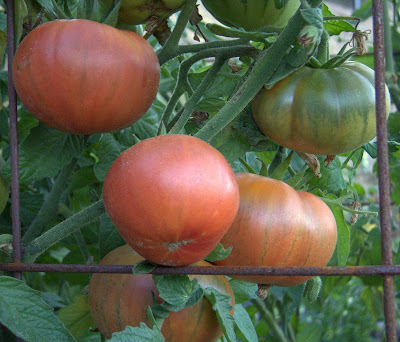 The tomatoes above should be ready to pick soon and there's more elsewhere on the plant. Yeah! Hillbilly is one of my favorite tomatoes. The golden chard is doing quite well and, for once, it is not infested with aphids! Last night we enjoyed it sauteed with garlic, pinenuts, raisins and a touch of sherry vinegar. Yum. 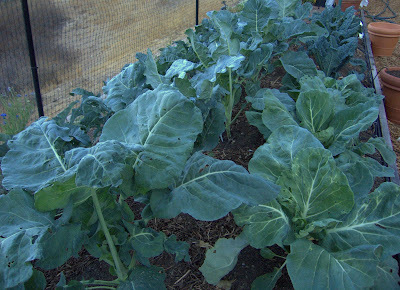 The brassicas are continuing to grow nicely. The Cavolo Nero is getting large enough that I can start picking some soon. 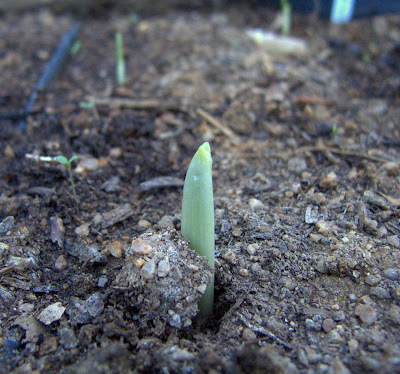 I noticed yesterday that the Tochliavri and Broadleaf Czech garlics are already sprouting. The sweet alyssum that dropped a zillion seeds in that area are sprouting also. I like to let the sweet alyssum volunteer around the garden, the beneficial insects flock to it. 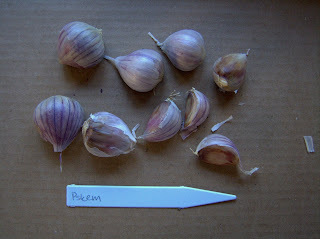 It will have to be weeded out of the garlic bed since the shallow rooted garlic does not like competition. Last season I allowed the Georgian Crystal garlic to grow scapes. I collected the bulbils and yesterday I planted the largest ones in a few short rows so that I can eventually grow them to mature heads. From what I've read, it can take from 2 to 3 years to get full size heads from bulbils. Georgian Crystal doesn't produce very many cloves per head so increasing my planting stock from bulbils is likely to take no longer than saving full heads. 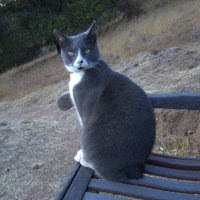 I've also read that growing from bulbils improves the vitality of strains, which I suppose is because they adapt more quickly to different climates and growing conditions. The bulbils should also be free of any soil borne diseases if the scapes are not allowed to come in contact with the soil. The rest of the bulbils I sowed thickly to grow for the sprouts. I'm guessing that the sprouts can be used like chives or scallions. My tomato plants are continuing to produce. Yesterday I picked a bowl of cherry tomatoes, some Paul Robesons, Large Pink Bulgarians, Ananas Noirs, and Not-Aunt Ruby's (aka the mystery tomato). A couple of Szentesi Semi-Hots were being munched on by the sow bugs so I picked them as well. That harvest inspired the risotto that I prepared for dinner. Char the tomatoes lightly over an open flame, remove the peels and stems, don't worry about removing all the charred bits of skin. Puree the tomatoes and cleaned peppers in a blender until there are still small bits of pepper visible, set aside. Saute the pancetta in the olive oil over medium heat in a 2.5L pressure fry pan until the pancetta starts to brown. Add the onion and cook it until it softens. Add the rice and cook until it becomes opaque. Add the wine and cook until most of it is absorbed. Pour in the tomato-pepper puree - add one cup of the stock to the blender container to get the rest of the puree and add it to the pan. Put the lid on the pan, lock it in place and bring the cooker up to high pressure. Turn the heat down to maintain pressure and cook for 5 minutes. Bring the pressure down using a quick release method and uncover the pan. Continue to cook the risotto over low heat, using the rest of the hot broth as needed, until it is nearly done - about 3 to 5 minutes for al dente. Add the cherry tomatoes and crumble in the goat cheese and stir until it is blended in and finish cooking - about 2 more minutes. I had also picked some fresh cutting lettuces so I prepared a simple green salad with pomegranate seeds, chopped roasted salted marcona almonds, hazelnut oil and pomegranate flavored vinegar. I spent the past weekend in San Francisco within easy walking distance of the San Francisco Ferry Building. The Ferry Plaza Farmers Market is on Saturday morning so that was my first activity of the day. I stopped first at the Blue Bottle Coffee kiosk. They brew each cup individually to order. A fantastic cup of coffee but I didn't happen to notice what variety of coffee it was. Then I popped inside the ferry building to buy myself a new market basket. Next stop was Rancho Gordo to stock up on some of their excellent dried beans. I wanted to buy every variety they had on hand but I restrained myself and came away with Good Mother Stallard, Red Nightfall, Yellow Eye, Mayacoba, and White Corn Posole. Della Fattoria bread was next on my agenda - one Campagne and one Levain. Then a breakfast treat from Downtown Bakery - an apple filled swirl shaped roll. There is an incredible selection of fresh produce, meats, seafood, dairy and other foods at the market. But I had to restrict myself to things that would keep without refrigeration for the next day and a half (and what I could carry in one basket!). Frog Hollow Farm had some lovely Warren pears and Apricot and Apricot Cherry conserves that went into the basket. Next I found a few crisp, sweet-tart apples that were a Braeburn-Macintosh cross from Hidden Star Orchards. A couple of gorgeous pomegranates also found their place in the basket. I could not resist a few cheeses from Andante Dairy - Variation No.1, Pecorino, Etude, and a goat log with ash. Massa Organics grows medium grain brown rice - one bag of which came home with me. A mixed variety of dates from Flying Disc Ranch also found room in the basket. And finally a bag of Tongue of Fire fresh shelling beans. Sunday afternoon I returned to the Ferry Building to stock up on a few perishables. From Prather Ranch I picked up some flat iron and hanging tender steaks and a whole pasture raised chicken. All their meats are vacuum packed so I can just pop them straight into the freezer. At Boccalone I purchased some Brown Sugar and Fennel Salame, Soppressata di Calabria, both sweet and spicy Italian sausages, Incanto Pork Ragu, and Pickled Goathorn Peppers. And who could resist the chocolate dipped dried figs from Scharffen Berger - not me. Oh, and how did that bar of milk chocolate with sea salted almonds get in the bag too! So, I came home with lots of good eats to look forward to in the coming days. Sunday night I had neither the time or the inclination to cook. Dinner was what I could scrounge from the fridge - the leftover caponata was great - but we did finish with some of those lovely dates with blue cheese - yum. 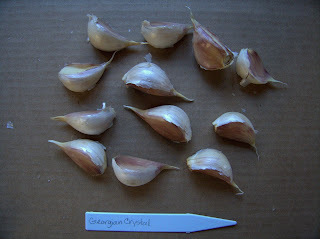 Here's the garlic bed ready to plant. I amended with a wheelbarrow of homemade compost and the better part of a bag of chicken manure to be sure that the compost doesn't tie up too much nitrogen. I also added a pound of crab meal, a cup of humic acid, 1/2 pound of sulfate of potash, and 3/4 pound of bone meal (probably should have be double that!). 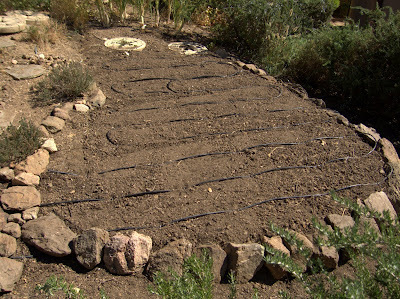 The drip lines (1/4 inch with inline emitters spaced every 6 inches) were laid 8 inches apart. 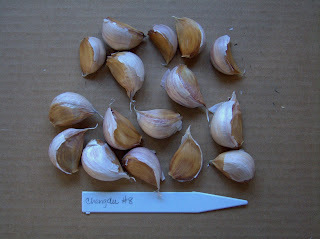 The garlic cloves were planted about 3 inches deep spaced between the emitters so they ended up in rows 4 inches apart, spaced every 6 inches. The final touch was some temporary cat proofing. I'll put some netting over the bed eventually. 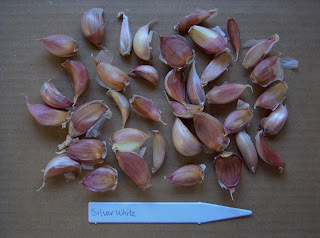 It must be the old accountant in me - I was curious to see how many cloves there were in each quarter-pound bag of garlic that I bought plus a quarter pound of each garlic that I grew last season. Then I had to take pictures of it. Oh well, here they are. Caponata is a classic Sicilian dish of Eggplant stewed with onion, celery, olives, capers, and tomatoes. Vinegar and sugar give it a mild sweet and sour tang and add to its keeping qualities. 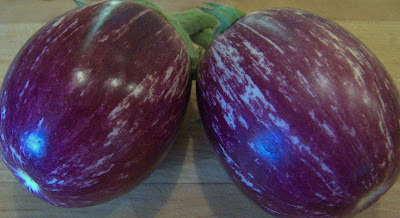 Last night I made it with Calliope Eggplant from the garden. I basically followed Judith Barrett's recipe from her book From An Italian Garden. Her recipe is unique for the addition of a bit of unsweetened cocoa powder. It doesn't taste chocolaty but has an added richness and depth of color that is wonderful. The only diversion I made from her recipe was using fresh peeled and chopped tomatoes instead of canned. I served that alongside a buffalo New York strip steak - that's buffalo as in bison, not the city in New York state. The steak was cut thin, so I pounded it lightly and then applied a spice paste to briefly marinate it. Trim excess fat from the steaks. Lightly pound the steaks to about 1/3-inch thick. Grate the shallots on the medium holes of a box grater. Combine the grated shallots, olive oil, fish sauce, aleppo pepper, oregano, salt and fresh ground pepper. Spread the mixture on both sides of the steaks and leave at room temperature for 30 minutes. Heat a ridged grill pan over medium heat and grill the steaks until medium rare. 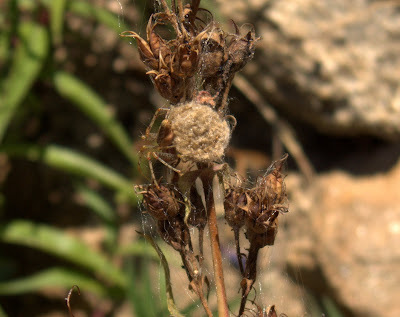 Here is Spider Mom guarding her egg mass. I was dead-heading the purple penstemon a few weeks ago and left this stalk for her. She has hardly moved since then. You can see her clingling to the left side of the mass. As soon as I started picking ripe tomatoes from the garden I started having BBT sandwiches for lunch. When the tomatoes stop, the BBTs stop. 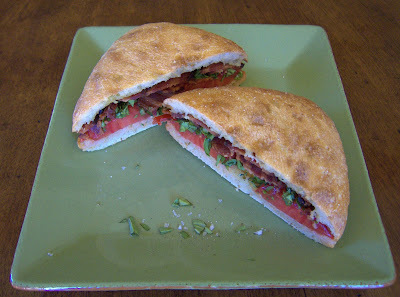 The BBT is my version of the old standby Bacon, Lettuce, and Tomato sandwich, but I use a generous amount of chopped fresh basil instead of lettuce. Basil tastes great with a good tomato and, frankly, I think that lettuce just gets in the way. Without the lettuce all the juice from the tomato can soak into the bread so that you don't lose a drop of that summer (OK, fall) goodness. I like to keep the BBT simple - a toasted La Brea ciabatta roll drizzled with a generous amount of extra virgin olive oil, thick sliced tomatoes from the garden sprinkled with a touch of salt (I'm enamoured of Murray River flake pink salt at the moment), a generous grind of black pepper, 4 or 5 pieces of crisp bacon, and a generous sprinkle of chopped fresh basil. Sometimes, when I'm feeling decadent, I add a bit of homemade mayonnaise. I like to hollow out the roll so that the contents don't squish out of the sandwich when you take a bite. There's quite a collection of roll guts in the freezer waiting to become bread crumbs. September and October have been prime tomato season in my garden. I hope that the warm days continue for a few more weeks so that the lovely green fruits sizing up now have a chance to ripen. Last night was pizza night. I don't keep my camera in the kitchen so you will have to use your imagination to conjure up a picture of how the pizzas came out. The toppings came from the garden, the pantry, and the fridge so you can glean some idea of what I tend to keep on hand. Pizza number 1 had peeled, seeded and diced fresh picked Carmello tomatoes, shredded whole milk mozzarella, diced pancetta, and a final sprinkle of chopped basil and parmigiano. The second pizza had manchego cheese, sauteed sweet onions and fresh from the garden sauteed Piquillo peppers. Piquillos are usually roasted and skinned, but I didn't feel like going to the trouble this time around. I julienned the peppers and slowly sauteed them with the onions, minced garlic, and a few branches of fresh thyme until they were meltingly tender. The skins were a little tough but not so much as to be a bother. The flavor was still fantastic. The final pizza was a little too weird for our friends that had stopped by. He looked at the thin sliced Yukon Gold potatoes (from the farmers market) that had been tossed with chopped Georgian Crystal garlic and olive oil that I was arranging on a cast iron griddle pan and dubiously inquired about what those were for. He looked even more dubious when I said they were going on a pizza. Too weird! She looked squeamish when I told her that the potato topped pizza would also have octopus on it. They left before pizza #3 made it to the oven - not because they couldn't take my weird pizza, but because they had an hour and a half drive home and needed to get up early this morning. Or perhaps it was the brussels sprouts that I was preparing to roast that made them look at their watches! Anyway, the potatoes are roasted until soft but not browned before they go on the pizza. The pizza is made with gruyere cheese, topped with the roasted potato slices, then cut up pieces of octopus (canned in olive oil) and I also used the last bit of diced pancetta left from the tomato pizza. My pizza dough is based on a recipe from The Rose Pistola Cookbook. The dough uses a small amount of yeast and a biga made the day before with a tiny amount of yeast. The biga ferments slowly in the fridge and the dough ferments slowly as well. The result is a very flavorful, bubbly, and chewy thin crust. I baked the pizzas in my little Beehive Oven. Pizza done in the beehive comes out far superior to oven baked. The pizza stone in my oven requires an hour to preheat and the hottest it gets is 550 degrees F. The beehive only takes a half hour longer to heat up but the temperature gets up to 700+ degrees F. on the floor and the dome gets to over 900 degrees F. Pizzas bake in just a few minutes and come out with a good crisp crust with nice little burned spots on the edges and the toppings aren't overcooked. The small size of the beehive means that you can only do one pizza at a time and they have to be rotated to evenly brown the edges - big deal, I'm not operating a pizzeria here. I burn a mix of almond and oak and use trimmings from my own oak trees for kindling. 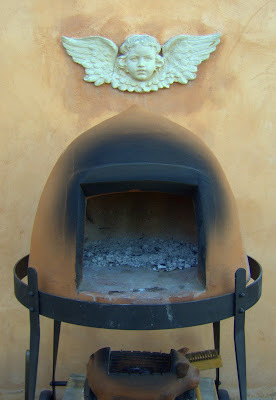 I've been very happy with my little wood-burning oven - it turns out great pizza, bread, roasts, etc. I dry much of my chile crop each year. Generally I just pop them into my electric dehydrator and let it run non-stop until they are dry. This year I'm being a little more environmentally conscious and am putting them out to dry in the sun. I don't have anything fancy like drying racks, just a few heavy duty paper plates that I can easily move. The biggest drawback to this method is that I occasionally forget to bring them in at night and the next morning they are soaked with dew from our cool moist nights. It takes much longer for them to dry but I feel good about using a little less power from the grid. 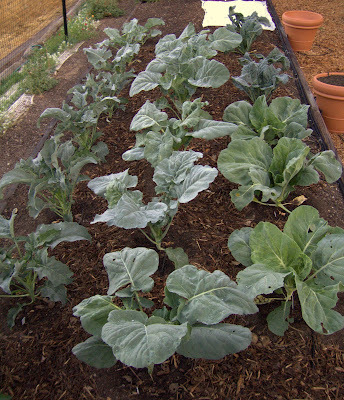 July 21 was the date that I sowed the seeds of most of the brassicas for my winter garden. They all went into 6-packs until they grew a few true leaves, then I potted them up into 4-inch pots until I got the garden bed prepared. The soil was amended with crab meal, sulfate of potash, humic acid, and compost. At planting time I added Sustane fertilizer and the flowering plants got some alfalfa pellets as well. I got the plants into the bed early in September. Spigariello foglia liscia, bottom left, from Seeds From Italy (their description) - Small, narrow and bushy leaves on a medium sized plant. This is the smooth leaf version. 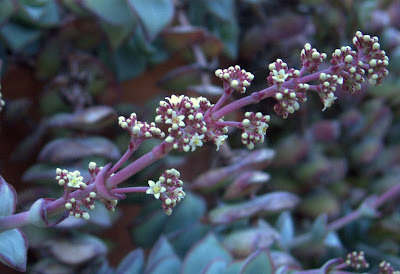 Has many small broccoli tops that will resprout when cut. It is a broccoli, with a taste between broccoli & kale. @ 70+ days to maturity. Exc taste. 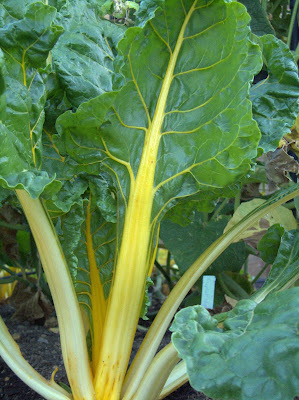 Often used with soups in Southern Italy though is good with pasta or as a side dish. Piracicaba, upper left, from Fedco Seeds (their catalog blurb) - (56 days) Open-pollinated. Pronounced peer-a-SEA-cuh-buh. “I couldn’t stop eating them” was the refrain of my wife Eli Rogosa and our trials maven Nikos Kavanya when I asked if they were serious about adding this funny-looking brassica with its even funnier name. Turns out Piracicaba is a city and river in Brazil famous for its beautiful waterfalls, and home of the university where this cultivar was developed. About halfway between a heading broccoli and a broccoli raab, these succulent tender small green heads with very large beads make delightful raw eating. Very loose heads, lots of side shoots, sweet stalks. Even the fairly large leaves make excellent greens. Garden writer Barbara Damrosch found it equally delicious steamed. NY State trialers report it is best as a fall crop with relatively good frost tolerance, although it was bred to withstand heat and has produced heads at temperatures in the 90s in trials in California. Already a hit with customers, it became even more popular thanks to Damrosch’s wonderful column about it in an October 2006 Washington Post. Romanesco Broccoli, center row, Franchi seeds but I don't remember from what source. 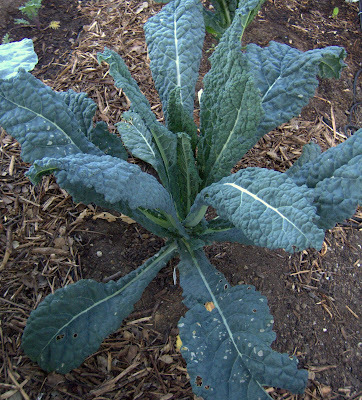 Here's a description from Seeds From Italy: It is more of a cauliflower than a broccoli. From Rome. Light green and long pointed heads with incredible swirls that form amazing shapes. Sweet nut like taste. 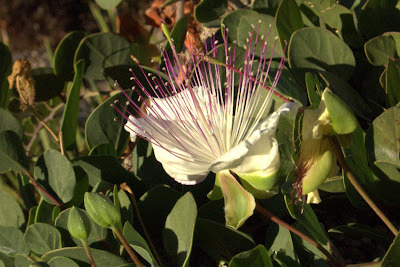 Requires fertile soil and frequent even watering to grow well. 90 days. Best for fall planting. Does not form side shoots. A few years ago I grew a Romanesco head that weighed more than 5 pounds! Penca Povoa Verde Portuguese Cabbage, bottom right. 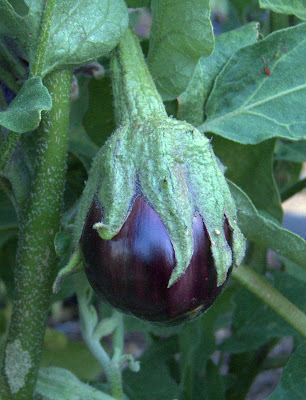 Franchi Seeds from Seeds of Italy. 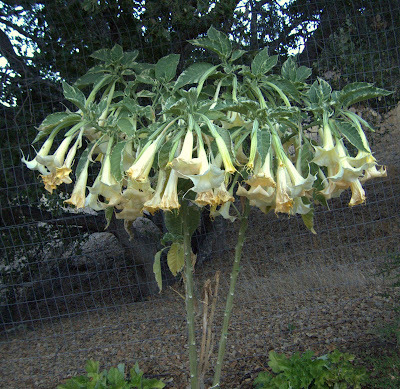 A non-heading type of cabbage. Very little information available about it but it seems to be used for stuffing. I grew another type of Portuguese Cabbage last year that was very good in soup. I'm looking forward to trying this variety. Cavolo Nero Toscano Braschetta, top right. 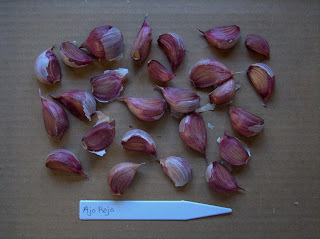 I got the seeds from an Italian member of the Seed Savers Exchange a few years ago. He claimed that this was the "true" strain of Cavolo Nero and it is indeed different from the strains that I've grown from domestically sourced seeds. His latest offering claims to be the really "true" strain. Regardless, I have liked every Cavolo Nero that I've ever grown or purchased. Beyond the brassicas under the floating row cover are Scarlet Nantes carrots and Chioggia beets. I have to cover the emerging seedlings to keep the birds from enjoying the tender young sprouts. Other things that I've sown for winter harvests are Olive Leaf rapini, Vit mache, Golden Chard, snow peas (don't remember the variety), Tonda di Parigi carrot, and Super Sugar Snap peas. The pots are going to be sown with wild Olive Leaf and domesticated Runway arugulas. And I have White Icicle and Red Fuoco radish seeds to sow in the bed. Oh, I can't forget the favas. I won't be harvesting them until the spring but they will be going in as I start pulling out the summer vegetables - probably some time in late November. I would like to find a spot where I can put some in early. I'm planting the few Crimson fava seeds that I saved from the past season. If that's a bust again (planted too late this spring) then I hope that Copia will be offering them again through the Seed Savers ExchangeYearbook. My main planting of favas is going to be Superaguadulce (Morocco Strain), Bavicchi seeds from Gourmet Seed International. 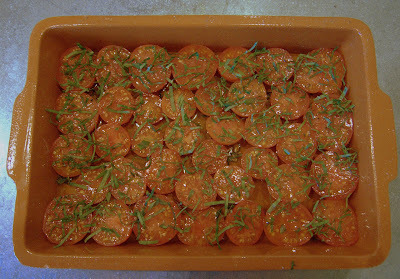 Here's a terracotta baking dish full of Olomovic tomatoes ready to roast. I make them almost confit-like with a generous amount of olive oil. Slice tomatoes in half and place cut side up in a roasting pan. Sprinkle with a little salt and fresh ground pepper. Drizzle with a generous amount of good extra virgin olive oil - the bottom of the dish should be covered with oil. Sprinkle fresh basil on top. Bake in a 200 F degree oven until they reach a consistency that you like, anywhere from a couple to several hours. I treat cherry tomatoes the same way and bake them until they are chewy. I am not the biggest fan of potatoes. It isn't that I dislike them, there are just other things that I prefer. That means that I've never really wanted to devote precious garden space to growing them. Now I've decided to give potatoes a chance. 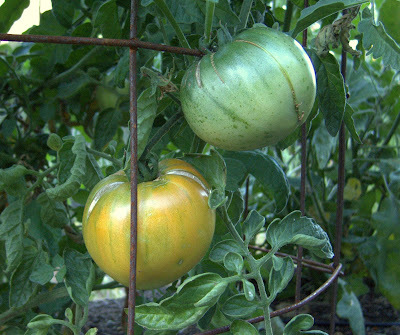 I took a class from Cynthia Sandberg at Love Apple Farm about growing winter vegetables. One of the topics she covered was growing potatoes in containers. Here's the method: Use 15 gallon nursery pots which have been disinfected with a solution of 1 part bleach to 10 parts water. Put 4 inches of soil into the pot and push 5 to 6 fingerlings or 3 to 4 larger potatoes into the soil. 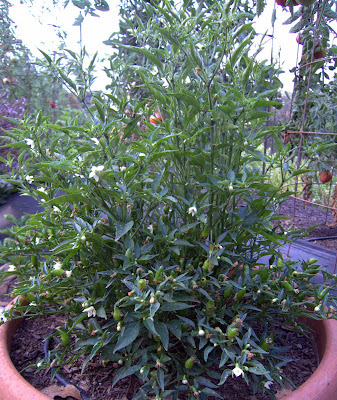 When the potato plants have grown about 8 inches add more soil to the pot to cover the stems. Each time the plants get about 8 inches tall add soil. Repeat until the pot is full. It is possible to grow them in the winter in this area if the tops are covered with frost cloth at night. When the potatoes are ready to harvest all you have to do is dump out the pot and sort through the soil to harvest the spuds. Early Rose - An old American heirloom, Early Rose has a smooth pinkish red skin and delicious white flesh streaked with red. A favorite back in it s day, it s fun to grow, harvest and sample raw. A spud with a great heritage, Early Rose is the parent to Burbank s famous potato and then the offshoot discovered in Colorado called Russet Burbank. 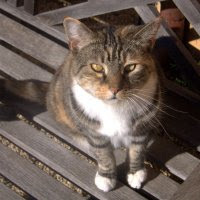 Charlotte - Good producer of medium oblong nuggets, sometimes slightly crescent shaped, with very thin, golden yellow skin and flesh with shallow eyes. Great salad variety and a real attention grabber. One of our favorites for eating throughout the year, excellent storage qualities. French Fingerling - A gourmet quality fingerling with satin red skin and yellow flesh with an interior ring of red when cut across. Produces good-quality, medium sized tubers which are a great addition to any plate. It is said that this fingerling arrived in this country in a horse’s feedbag. Early variety. Garnet Chili - This is an 1853 heirloom and a parent of many potatoes. Rose-to-red skin, it has a real potato look and same nutty flavorful taste of a century ago . 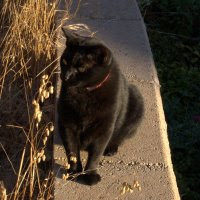 . . with rounded eyes and rolling characteristics, sometimes irregular shapes. Thick-skinned and a terrific keeper. LaRatte - Similar to the Russian Banana with its yellow skin and flesh. This fingerling has a rich and chest-nutty flavor and has long been a favorite of fine chefs. Wonderfully smooth and creamy when pureed yet maintains a firm texture when cooked. Mid to late season variety. Yellow Finn - In Finnish “Niku Lapua”. This is the classic European yellow-fleshed gourmet potato. Yellow Finn’s buttery sweet flavor distinguishes it from any other potato. Produces excellent yields of flat, round, sometimes pear-shaped tubers. Performs best with a lush, long growing season. Moist, mashable texture and an excellent keeper. One of our favorites. Perhaps, after growing these interesting potatoes, I just might become more of a fan. Anyway, it will be an interesting experiment. 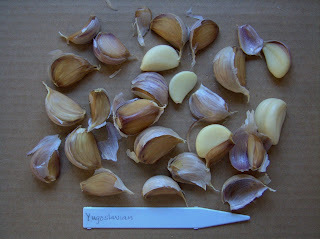 It's time to plant garlic again! 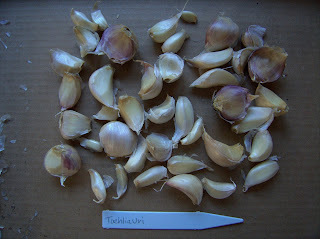 The last garlic crop did quite well so I'm encouraged to try more varieties this year. They did quite well in my gritty native soil last season I'm planting them in the same part of the garden instead of in the new fenced-in vegetable garden. I've turned the soil in the area where I had the Crimson Flowered Favas and I'm going to amend with bone meal, sulfate of potash, chicken manure and compost. 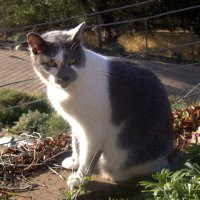 I have eight little brown paper bags from Filaree Farm sitting on the desk. This year I remembered to order my garlic early so I got a nice variety and found a few that I missed out on last year because I waited until too late to place an order. 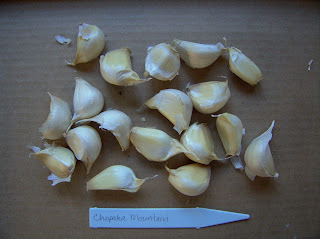 I've also set aside some of the last garlic crop ( Broadleaf Czech, Tochliavri, Georgian Crystal). With only a quarter pound each of just three varieties I didn't harvest much green garlic last year so next spring I hope to be enjoying a lot more of it. One of the first dishes I cooked with the fresh crop was roasted garlic. Use a whole clean head of very fresh garlic. Don't even think of making this with old sprouting garlic. Cut off the top quarter of the head. Place root end down in a small roasting dish or ramekin or terra cotta cazuela and drizzle with extra virgin olive oil and sprinkle with a little salt. Add stock or white wine or water to come up 1/4 inch. Add a small branch of thyme or not as desired. Cover tightly with aluminum foil and roast in a 375 F. degree oven for about 30 minutes. Serve warm with bread or toast. 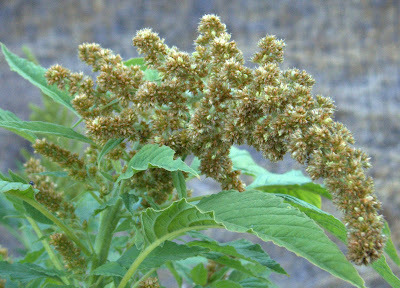 The neem oil that I applied to a couple of my chile plants last week does seem to be working. I had shaded the plants after spraying because I was afraid of leafburn. While the plants were shaded it didn't seem like the neem was working - there were still a lot of aphids. After a few days I let the plants sit in the full sun again and then I started to notice that the aphid population decreased until it seems there are very few left now. It seems that I need to be more patient. I sprayed a couple more plants a few days ago and didn't shade them - so far it seems to be OK - the plants don't seem to be suffering and the aphids are decreasing. 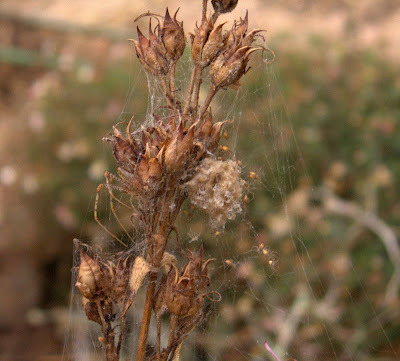 I've also noticed a number of aphid mummies so it seems that the parasitic wasps aren't being knocked down. 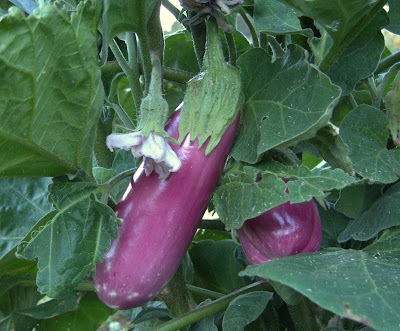 Neem has also been quite effective at keeping powdery mildew under control on the zucchini plants. I noticed over a month ago that spots were developing on the tops of the leaves and the bottoms of some leaves were heavily infected. Typically, in this cool moist evening climate, once powdery mildew sets in the infection spreads rapidly and squash plants can completely succumb in a matter of weeks. I started spraying with neem about once a week and the plants are holding up surprisingly well. Chiles and Aphids and Ants, Oh My! This has not been my most successful season so far as chiles go. 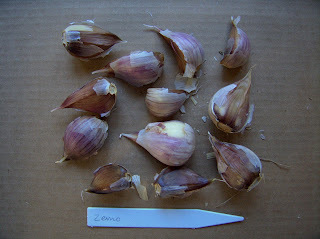 First my Friarello di Nocera seeds were not viable - not one single seed germinated. Then my Rocotillo plant met an untimely death - cause unknown. Then the aphids hit most of the chinense peppers so I hit back with an insecticidal soap and pyrethrin combo spray. Unfortunately the weather got hot and I learned about phytotoxicity. Do not spray with insecticidal soaps and oils when the weather is hot - bad idea. Some of the plants dropped a lot of leaves and flowers so my crop will be severely short. And the aphids came right back along with an army of ants to farm them. Now I'm trying other organic control methods. I tried neem oil on a couple of plants a few days ago. Neem can also cause phytotoxicity so I made sure that we weren't expecting a heat wave and I shaded the plants to be sure they didn't get too hot - just in case. But neem doesn't seem to have helped... it seems that I probably have the Green Peach Aphid and neem and other oils are not very effective against this particular pest. They are really getting out of hand on some of the plants so I have one more thing to try. UC lists pyrethrin as an organic treatment for green peach aphid. So I'm going to try the pyrethrin without the insecticidal soap. Ants - oh how do I hate ants. 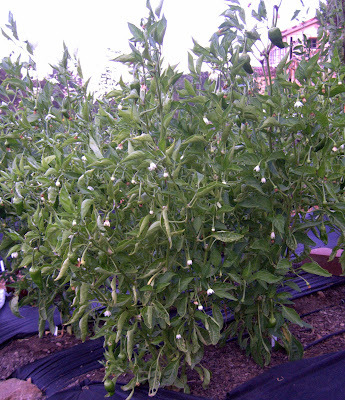 There are trails of them leading to all my aphid infested chile plants. I put out some homemade ant bait of sugar water with boric acid. 1 cup water + 2 cups sugar + 4 tablespoons boric acid powder. They lost no time finding the stuff and nearly emptied the containers in a few days. The good news is that the bait seems to have distracted the majority of them away from the chiles. The bad news is that the trails are still running all through the garden. Am I making any dent in the population or am I just feeding them? It's not all bad news though. 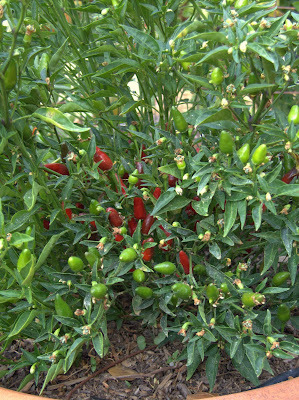 I finally tracked down an Aleppo chile plant this year and, as you can see below, it is doing ok. 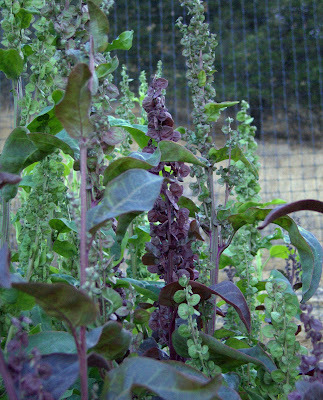 The aphids are there and I did spray. 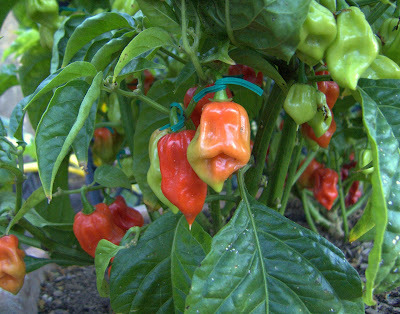 Fortunately, the annuum plants don't seem to be as susceptible to damage from insecticidal soap sprays as the chinense plants. I had the plant caged earlier in the season to isolate it for seed saving and there are a few pods that developed from that time that I've marked. I haven't tasted the dried chile yet - can't wait to try. 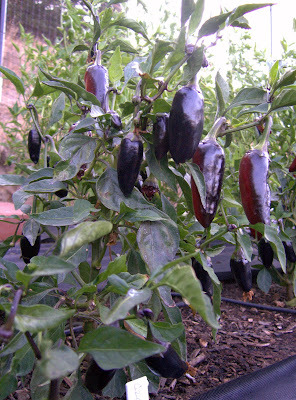 Another chile that is doing well this year is Ciliegia di Calabria. I was worried about the viability of those seeds since I got them from the same source as the Friarellos but I got three plants to grow. Unfortunately I did not isolate the plants for seed saving. I've picked a number of pods already and have been drying them in the sun. 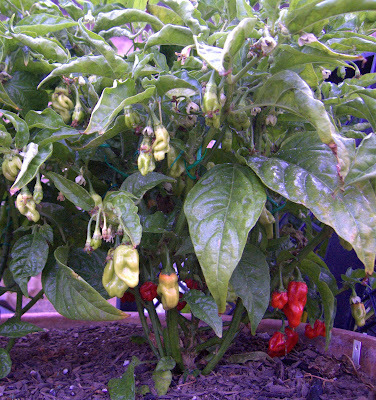 They have a nice heat level, something like a jalapeno (the hot ones not the wimpy ones). 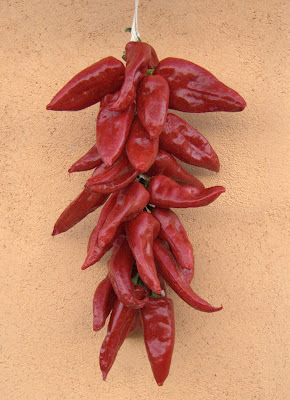 One of my favorite chiles is Pimento de Padron. I've been growing them every year now for 6 or 7 years. My plants are doing quite well and I'm harvesting enough to fry up a generous panful once or twice a week. If you become as addicted to these chiles as I have you will have to grow them for yourself since they are quite expensive and hard to find. 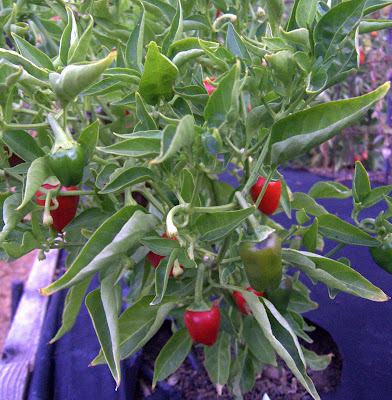 There's a few chiles on the plants shown below that are nearly ready to pick. The chiles are picked when they are very young so the plant keeps blooming and pumping out the pods over a very long season. When picked young enough they have no heat but will develop some hotness as they get bigger. Another Spanish chile that I started from seed this year is the piquillo. I've been experimenting with Spanish cuisine for a while now and had to try growing this chile for myself. 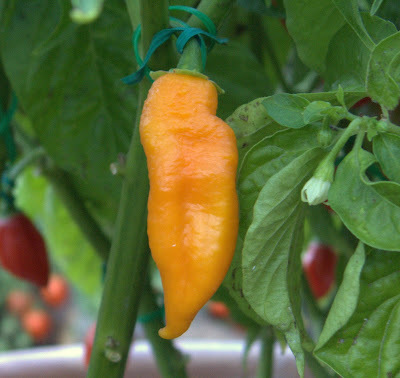 It is a delicious pepper. Roasting it to peel is a tricky business though. 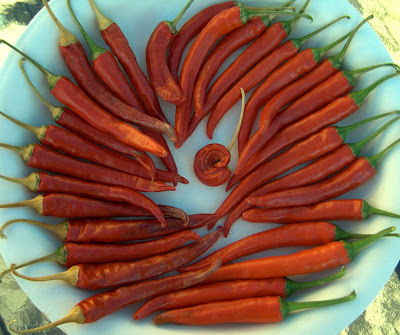 It is a thin fleshed pepper so it is easy to get the flesh too soft when roasting so that when you peel it the chile disintegrates. I've found that placing the peppers directly on the hot coals of a fire - no flames - burns the skins quickly enough to not roast the flesh too much. 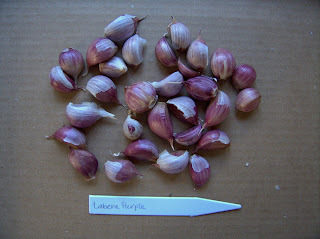 I roasted some recently to use in a calamari salad from Jerry Traunfeld's book The Herbal Kitchen - delicious! The Czech Black pepper seems to be happy also. It was described as having heat something less than a jalapeno. Considerably less to my taste buds. It is, however, a pretty thing. The pods ripen up to red and black. 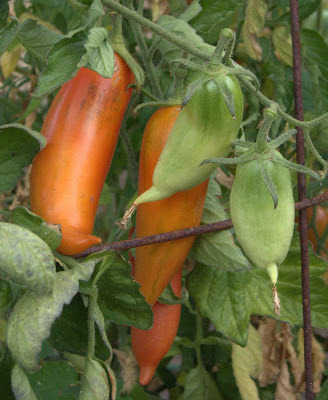 If left on the plant to ripen to full red they get wrinkled. When the pods that still have a lot of black are cut open the flesh inside turns out to be red. 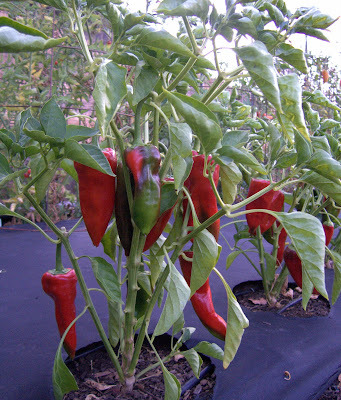 It is not unusual for some of my chile plants to survive the winter and produce for another season. 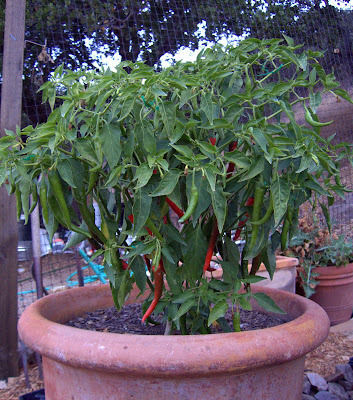 That's why I grow a lot of my chiles in large terra cotta pots - not that that improves their chance of survival, but it makes it easier to rotate my beds. I really don't want to have to dig up the survivors so that I can rotate a different type of plant into that bed. This year there was only one survivor and not the one that I expected. My thai chile is back. It died down to just a few stems a few inches tall and now look at it down below! 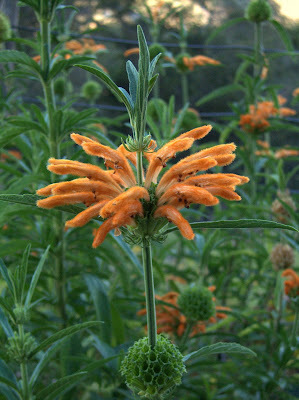 So, one more chile plant that I photographed this morning. One of my favorites that I've been growing for about three years now - Datil Sweet. It is infested with aphids at the moment. You can see the shine on the large leaf on the right that is the aphid honeydew. Normally the ants would be all over the plant "harvesting" the honeydew. I tried something on this pot - not strictly organic - a desperate measure. You can't see it, but I put a band of brown duct tape around the pot and then took a double length of garden twine that I placed in a plastic bag and doused with nasty horrible (effective) ant spray. The twine then got wrapped around the pot (wear gloves!) over the duct tape. The ants will not cross the twine. So long as the chile plant is not in contact with something that the ants can use to bridge over the twine they can't get in! This particular chinense plant seems to have been less affected by the insecticidal soap/pyrethrin spray. It didn't lose nearly as many leaves and flowers. You can see some green twist ties that are marking stems that had unopened flowers when I caged it for seed saving. There are a number of pods that can't be seen that are marked for seed saving.